Extended Stay Deluxe Jacksonville Butler Blvd. 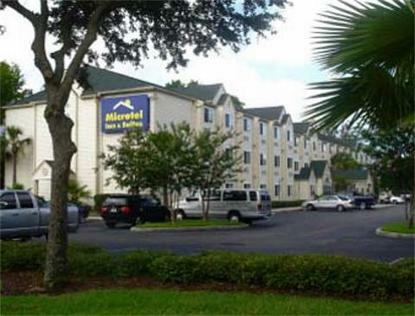 This Microtel Inn and Suites Jacksonville hotel is located one block west from I-95, Exit:344, off Butler blvd. Bonneval road. All interior corridors guest rooms feature free high-speed internet, free local and long distance calls, complimentary continental breakfast, personalized voice mail, bay windows with cushion seat, and newly design signature suites.The hotel is 20 miles from Jacksonville International Airport, 10 miles from Craig Municipal Airport, 12 miles from Jacksonville Beaches and Zoo, 10 miles from Mayo Clinic and one mile from St. Lukes Hospital, 7 miles from Downtown, Alltel Stadium (Jacksonville Jaguars), Gator Bowl, Landing, Fairgrounds, Museum, and Convention Center, 3 miles from University of North Florida, St. John Towne Center, Tinseltown, the Avenues and Regency Malls. The hotel is next to major restaurants and minutes from Saint Augustine. The hotel amenities include, dataport phone with wake-up calls, hairdryer, iron with ironing board, alarm clock radio, microfridge, air-conditioning, 25 inch cable TV with over 75 channels and movies, 24-Hrs coffee/tea and guest reception/service, local restaurant dinner delivery, free parking, meeting room, guest laundry/dry cleaning, vending, housekeeping service, safe deposit box, elevator, ice machines, lobby newspapers, and Micro Business Center includes print/copy/fax services. All newly design suites includes sofa bed, work desks, coffeemaker, microwave, refrigarator, and bar sink with cabinates.Please note that rooms on two floors of the hotel are smoke-free. Adjoining rooms for family, Accessible rooms for wheelchair, and Suite rooms for extended stay are available upon request. This hotel is pet friendly. There is a 15 dollars per pet, per day extra charge. Please ask guest services upon arrival for any specific hotel policy. Located on the southside of downtown Jacksonville. Minutes from the beaches and shopping. 7 miles from the downtown area.